Mr Tonsilpus has caught your imaginations I see. The FB group is up and running and I have now registered him for his own website, so look out for the link (he may have his own blog soon too)! The charity I have chosen is the London Air Ambulance and you will find a widget on the left so that you can donate (if you wish). I'm hoping Mr T will raise at least five grand for the charity and it is up to you to make that happen. Of course, he'll need to have those adventures we are all talking about now, right? He's been promised a 'rideout' on the air ambulance and car very soon and he starts touring the UK in a few days before leaving the country for warmer climes. Thank you for your enthusiasm with this - it's been great fun so far! The torrential rain has eased and tonight was clearer and drier but it didn’t stop yet another driver from trying to kill me as I ran on a call. She turned right ahead of me at a major junction as I sped towards her at 60mph but instead of continuing so that I could just drive past, she stopped dead in the centre of the road, blocking my path. I heard a loud screech from my brakes as I slowed and took evasive action by swerving around her tail. Then she coolly drove off. The police helicopter (India 99) hovered overhead as I tried to find the scene of a RTC in which a woman had suffered neck injuries and I got three different locations sent to me until I eventually arrived to find a bit of chaos in a narrow street. An armed pursuit had taken place and the people the cops were chasing had crashed their vehicle (well, the one they'd nicked) before legging it out of the area. They left a poor 50 year-old lady trapped in her car after they’d rammed her off the road. Her door was crushed against a post on the pavement and the passenger door was stuck fast – the front end of her vehicle had been ripped open when they collided. It took almost an hour to free her from the car. The roof had to be cut off by the Fire Brigade and then she was taken out on a board. She had mild neck pain and lower rib pain but otherwise seemed unhurt. Emotionally, however, she was a wreck. I hope they catch these selfish violent mongrels. On the subject of violent mongrels, two females, one after the other, approached the car saying they'd been punched in the face. The first girl had been assaulted by another female who thought she deserved it because she was ‘fat’ and the second was punched so hard by a man outside a club that she hit the ground and her nose was broken. ‘I can’t believe a man hit me. No-one deserves this’, she said through angry Irish tears. Of course, she’s right but as the clubs spilled out in the early hours, the rabid little drunken hounds that muddy the waters for a good night out mixed among those trying to go home peacefully. With such individuals in the crowd, these random, unprovoked assaults are sadly predictable. No time for a VDI this evening as a Red3 was passed to me and I was sent to a 'broken nose'. I couldn’t get an answer from anyone about why this would be categorised so high but when I got on scene I found police with a male who’d been badly beaten up and who’d sustained very deep, almost to-the-bone lacerations to his face. The man was an ice cream vendor and he’d been attacked during an argument. The assailant had pulled his T-shirt over his head and then proceeded to punch him heavily with a hand that was covered in rings. The poor man’s face was a mess and he had a broken nose and possible broken cheek. The possibility of a fractured base of skull was real too, so I got an ambulance for him as soon as possible. Once again the battery drained on the car as I sat on stand-by waiting for the next call, trying to demist my windscreen. The fan was running at top speed for only a few minutes and the screen stubbornly refused to clear, giving me the prospect of a dangerous journey to the abdo pain that had come in. Unfortunately the power required to achieve (or in this case, fail to achieve) the task of producing visibility removed the power required to start the engine. So, I was off the road and waiting for another rescue. Luckily, within an hour, the man in the van showed up and I was empowered once more. I didn't do anything after that though. Everyone seemed to have forgotten I was around. Well, thank you all very much for being so enthusiastic about this! I have so far received almost thirty invites for him to travel across the USA, Australia, New Zealand and other far-flung (and a few not-so far-flung) places. So, the plan is to create a Facebook group which you should all join when you get the invite (I will place a button on here). Then I will send out a little form for you to fill in if you are taking custody of him. I'll need to know where he's going, when and what you plan to do with him. All of your personal stuff; name and address, will be kept strictly private but I need to have a valid postal address. Mr Tonsilpus will travel with a little passport which custodians will sign and record a little note in, stating where he's been. You may photograph him and video him and they can be shared with everyone on the FB page. Then, after your holding period is up, I will email you to advise you of his next destination. This means, of course that you will have the next person's mailing address and will be responsible for posting him off (at you own cost, I'm afraid) but I will try to keep the next destination within reason to limit your postage costs. If you don't mind this, then please re-apply when the Facebook page is up. Incidentally, my email address has always been accessible via the blog - it's thexfileman@aol.com. The DEADLINE for initial applications (just an email or message to say you want him) will be the 1st of September. After that, he will be prepared and sent off to the first applicant, probably in the UK for a tour of his home ground before setting off abroad. Of course, you can still apply to have him as he travels but I will want him posted off in a logical way to limit the time he is exposed to the outside world (he's only little and a bit fragile). He will return to a UK host before finally coming back to me at my office address in London. This is all a bit of fun but I'd like, with your permission, to do something magnanimous with him - if this goes well, I'd like everyone who is taking him (and those of who are just watching) to contribute a little bit to a charity that I have in mind. A link will be set up so that you can donate directly to it and then, when he returns home with all his experience and a fully completed passport, I will auction him off, passport and all - again for charity. 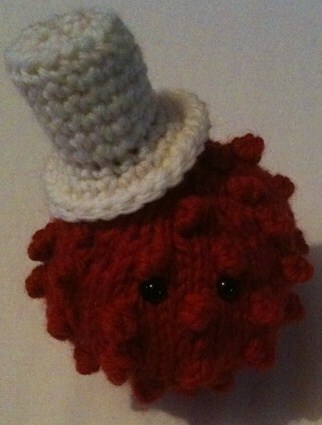 If you want to ave a little Tonsilpus of your own, I can ask Lottie - who made him - to knit you your very own Mr T! Just email me and I will pass on the request. She will probably need to charge for him but I will leave that to you and her. What do you think? If he travels to a lot of places, I might pack myself in an envelope and try it! So, the big headline news is that we are currently dealing with one drunken (or alcohol-related) person every eight minutes. I did a bit of calculating and this is what I discovered: there are 288 hours in 24 hours (clever, eh? ); that means there are 36 eight-minute periods every day. Effectively, as long as we are taking on an alcohol call every eight minutes, there are thirty-six crews in work if they all take one call a shift. There would still be three or four crews employed if they were dedicated to taking every call of this nature every shift. Alcohol-related calls are a waste of time for the most part, as well as other minor and time-wasting jobs that we encounter every single day, 24-hours a day, but the caveat here is that dozens, if not hundreds of additional people are gainfully employed as a result – across the UK, that could amount to thousands of individuals, including of course, nurses and doctors. I don’t like the waste – you all know that; our tax money and precious life-saving skills are frittered away on these people but I am pragmatic and realise that they are the source of some, if not most of my income. That, however, will not stop me believing that it is time to penalise them - a steep fine when they sober up is required. The long four-night weekend starts now and a strange assault call came to me with a request to let Control know if an ambulance was required. The cops were on scene with a young girl who had (by her own admission) hit a 61 year-old man with a bottle, which shattered and sliced open his hand. The man was denying this and stuck to a story in which he sustained the injury during a fight between two young men who were with the girl. He said he’d ‘smacked one of them in the mouth’ and the toothy contact caused the damage to his mitten. This story, of course, helped keep his ‘hard man’ character intact, whilst the other one – where a girl hit him with a bottle (and the evidence for that was everywhere) – led to his emasculation in front of his neighbours, who’d witnessed the fracas and, in fact, bore out the story given by the young girl. It was strange to hear this teenager telling the cops all they wanted to know – confessing it all – while the assaulted man denied she’d ever hit him. It meant she’d get away with it and that, from what she was saying, was something she didn’t want. ‘I did it. Take me away if you need to, I don’t mind’, she said to the very bemused cops. They must have thought Christmas had come early. I had to take him to hospital because a vein or two in his hand had been severed. Blood spattered and pooled, depending on his movements after the assault, all over the place. It smeared and dotted the windscreen and body of a car outside the man’s flat. The car belonged to some poor sod who’d wake up in the morning, stretch his body for the coming day and then scream blue murder at the sight of someone else’s blood all over his beloved carriage. If I could spend the extra time awake just to witness it I would. ‘Were you knocked out at all?’ I ask. He points exactly to the place he was hit on the head. He also knew what had been taken from him and, while his girlfriend (with tears in her eyes) and other friends stood around him, he seemed to feel a lot worse. He was lucid and not at all bloodied by the incident. I wouldn’t want to detract the seriousness of his experience of course but I think he may have been clubbed by a rubber mallet. Maybe a clown robbed him. A cardboard box crushing woman twisted her knee so badly at work that she needed a lot of morphine to stop her screaming in pain. She had been stamping down cardboard boxes at work when she suddenly lost her balance and fell over, twisting her leg badly as she went. Her knee cap wasn’t the culprit; her entire knee joint was over to the left at an unnatural angle, so I was asked to support a crew who was already on scene and bring on the Class A drug. She needed heavy-duty pain relief, not just gas and air. She also needed a lot of padding and splinting before we could move her – she was a largish lady and we had very steep stairs to descend. The chair was out of the question, so I asked for another pair of hands and got the nearest cycle responder to help. It took a while but eventually we got her down by strapping her securely to a board and using the four of us to carry her from the first floor. I had warmed up nicely at the end of it and we all took a moment or two to cool down before setting off for hospital, where that leg could be x-rayed and hopefully fixed. A 17 year-old Somali boy crashed after being chased through the streets by police. He was riding a moped and had a pillion passenger with no helmet on, so naturally that attracted the attention of the local cops. He tried to run on foot when his bike met its demise after rounding a bend too fast. His mate got away but he was grabbed by other cops who turned up on scene. I was called because he’d complained of leg pain but all I found was a couple of baby-sized grazes and a very smelly foot. He was fine and well enough to go to a police cell for the day, if not the night. I think he needs to consider some clean socks before he goers onto his next great adventure. This is Mr. Tonsilpus - he's the creation of something I came out with a few weeks ago when I was joking about a children's character that could be related to this business. Lottie thought she'd knit him for me though and now that he's 'real', with white pus hat and all, I want to do something with it. This blog is read in more than 110 countries around the world, so why don't we try to send Mr. Tonsilpus to every one of them on holiday? All I need is an applicant from each country who would like to take him somewhere interesting and photograph him. The pics can then be posted on a Facebook page that I will create for the purpose. I think it will be an interesting experiment; similar to others that have been done with teddies etc. It will bring many of my readers together too, so let's try it. All you need to do is apply by email for Mr. Tonsilpus, starting in the UK. I will post him out to you and you will have to post him on to his next 'assignment' when I get applications from other countries. He's only little, so we aren't talking about a huge postage bill. Anyway, I will try to send him off to the next country neighbouring yours when the time comes. Take him somewhere interesting or unusual and post the photo (or video) on the Facebook page when it is up and running. You MUST take good care of him and try not to lose him please. No offensive pics will be published and if he is not received by the next applicant when expected, the experiment will cease. Let me know what you think. It'll be fun if it goes well. You may, or may not have noticed a few changes that have been going on recently - I've stopped reporting statistics and detailing every call on every shift and I'm not reporting as often as I used to. I've been writing this blog for more than four years and it has been hard work. Not that this has deterred me in my mission to uncover the game we play out here - the tragedy, sadness, abuse and downright stupidity that my colleagues and I face every day. It has tired me out over the years and I sometimes find it difficult to see wood for trees; clinically this makes it a risky business. So, I'm giving my family more time, paying more attention to my business and getting on with my future career. I'll be coming 'off the road' in due course - I need a break from the stuff I've been working with over the years, especially as a solo on the car. I may opt for a six month hiatus, possibly longer but I will still be writing - I'll just be writing differently. Postings will now cover calls that are interesting or relevant... or that have a pertinent point to make. I've recorded two years of stats and I'm sure those of you who have bothered to look closely at them will be as shocked as I am about the nature of our emergency system and the abuse it suffers. Nobody is doing anything about it - we are just throwing more money at it than ever before. This is not the time for such reckless spending of public money. This change isn't new. When I first started the blog, I reported only those jobs that were worth writing about, so I am just going back to my roots as it were. I also need time to finish the novel, which is 2/3 complete. A final push into my fictional world will be worth more in terms of enjoyment than a continuation of my record of nonsense calls and drunken behaviour; or as one unkind person described it - drivel. I am also very restricted these days - the bigger the blog has become, the worse the imposition on my right to free speech. If I could write exactly the way I think and speak, not only would I feel happier about it but I would spend less of my precious time editing and re-editing every post (sanitising them almost) and you would be reading me as I am, without the flannel and sterlisation. There it is then. The blog is changing and hopefully that will be a good thing. I am proud to have been the inspiration for so many new paramedics, some of whom I've met at work without knowing why they know who I am. This is a positive thing; it shows that my writing has been good for something and may well have shaped the future of people I would otherwise never had anything in common with. I'm going to get on with the books I have planned because I love to write but I love it more when I don't have to listen to other people telling me what I can and cannot write. A couple of interesting calls this week; one involving a three year-old girl who fell onto her arm and possibly fractured or dislocated a bit of it. Whatever she’d done, there was no way on Earth I was going to get a good look at it because she was screaming her little lungs out, so much so that I could feel my eardrums vibrating. Her mother eventually gave up on the whole idea of me taking her to hospital and it was agreed that they’d bring her in themselves (dad and a sibling were on scene too) if she didn’t move the arm. I saw them in A&E later on – waiting in the x-ray department. An Australian woman fell down six steps and smashed her face on the concrete when she landed. She was with her husband and friends when I arrived and she was concussed – repeating over and over again ‘what happened?’ as concussed people tend to do. Her facial injury seemed innocuous but she lost consciousness briefly after vomiting and I had to put her into the recovery position to prevent her from aspirating. Now I needed an ambulance. I had done well so far; conveying all of my patients to hospital without the need to ruin a crew’s day but this was a bit more serious and had to go properly. The crew was with me within a few minutes and the lady, who by now had recovered from her passing out episode, was taken away with her husband. I took the two friends in the car so that they could all be together. Then a 58 year-old man thought he was ‘choking’ in a museum after swallowing meat (therefore undermining the very act of choking. In fact, his obstruction was low down in his abdomen, at the point where the stomach sphincter, known as the Pylorus, allows the passage of broken-down (not depressed) food into the first part of the intestines. I suspected a physical obstruction at that point and he probably had an ulcer lurking around too because he was projecting mucus into the room every now and then – not acid and not bile – mucus. Anyway, I lay him down for a proper abdo exam and found the plugged bit of food where I expected to feel it. I massaged the small area around it to check for pain and the lump of stuff moved away. He sat up completely pain-free - no more sense of an obstruction down there and no more mucal explosions from his mouth. He was happy to leave it at that but I asked him to get checked out as soon as possible. Various other problems are associated with this; cancer, Pyloric Stenosis (but that mostly affects children) and ulcers, for example. Another shoe-based incident occurred at an underground station when a 6 year-old got her toe dragged into the metal teeth of the escalator, resulting in a sliced big toe. She was lucky; I’ve seen much worse and all I had to do was clean it, dress it and take her and her parents back to their hotel to get over the shock of it all, which I'm sure they'll find easy considering the five-star luxury they were staying in for their holiday in London. Neglect of the elderly and vulnerable is rife in this country; my first call to a 74 year-old woman with abdominal pain revealed a lot more than just her acute condition. Her ‘carer’ was on scene and I got very little information or interest out of her. The crew fared no better when they arrived. The woman had high blood pressure, swollen ankles and an irregular pulse. Her ECG showed some worrying changes and when the electrodes were applied to her skin we found suppurating areas where the tissue was peeling away. It smelled rotten and her necrotic condition extended to different areas of her body. When I palpated her ankles my gloves lifted off wet skin – not nice. This poor lady is being neglected disgracefully. We took her carefully to hospital. Apart from the odd kind-of interesting cardiac call, I was bounced around for cancellations all night and the most fascinating thing to happen was that I found a grasshopper in the car. I threw him out onto the street and he headed back towards the car again. I thought once I’d closed the door and left the street he’d be a memory but about an hour later he appeared again, this time on the outside of the windscreen, crawling happily along! I saw him again once or twice and decided to leave him alone. He was happy and if he wants to live out his little green life on a Vauxhall Zafira then who am I to judge? People who weren’t happy, however, included the drugged up man in the back on the ambulance I was in and whose BP was dropping as a gang of weapon-wielding (I’m sure one of them had a sword) thugs surrounded the ambulance after attacking someone on the street. I called for police assistance but the mob moved on, searching for another victim – someone specific I think. It was a tense moment for me and the crew inside the vehicle. We thought they might try to get in. It happened before a few years ago when a man being chased by such a gang burst into an ambulance while the crew was treating a patient. The gang simply followed him and stabbed him to death in front of the paramedics. The patient got no better after fluids, so we took him in, rapidly, to hospital, where he spent a while in a queue of stretchers and chair-bound ‘sick’ people until he was brought round with some gentle but firm violence from one of the nurses. His pupils were pin-point and he was clearly more than just drunk on alcohol – if he was ever drunk on alcohol in the first place. A 42 year-old woman with a recent history of severe headaches and nausea had her blood pressure tested at work and found it to be high. I double-checked and had to agree with the figures. This was one of those Green calls that turn out to be a little more significant. She was stable so I took her in the car and we chatted about the exclusive club where she worked. I might even join – if they take council-house-bred scum from Glasgow that is. Later on I was called in support of a crew to attend a 30 year-old man who’d become unconscious in a pub. Now, I know what you’re all thinking and that’s what I was thinking too but this guy had collapsed with ‘exhaustion’ according to his mates. He was in the recovery position and awake when I arrived with the crew and the first thing he told me – and pertinent to his ongoing care – was that this sort of tiredness collapse had happened to him before when he was a teenager and then again a few years earlier. He’d been drinking but it wasn’t the booze that was affecting him like this. His ECG was abnormal, showing a possible long QT and his BP dropped in concert with his irregular pulse; none of which would manifest as a result of fatigue, unless he was almost tired to death, which he wasn’t. He was taken into hospital for further checks. Drink, run and attempt to jump off the bottom four steps at a tube station in order to catch the last train home and you’ll probably fall onto your head – as did my next patient. The 30 year-old cracked the back of his skull open and bled onto the cold stone floor as his girlfriend leaned over him and underground staff mopped up what they could with a dressing. Initially he looked in no danger but as things progressed (two crews and a collar & board), he became a bit irritable and only oxygen through a trauma mask seemed to settle him. That meant he was going to a more suitable hospital for his head injury. That also meant a long trip south for me. Sort-of drunken young women entertained me as I drove two of them ahead of the Booze Bus containing their properly drunk mate and her twin sister (who wasn’t drunk). They were loud but funny and came out with some of the most amusing stuff I’ve heard in ages. Usually I get abuse and trouble from inebriated souls but tonight was happy night I think. When we got to hospital they were freed from the car and allowed to cause havoc with their loud voices and inappropriate photographing. Security didn’t take too kindly to them but they meant no harm. Their friend, meanwhile, was given a cubicle to lie in while her sister fretted beside her. Eighteen year-olds learning the lessons of alcohol – possibly. Don’t wind down your window when a complete stranger approaches your car and his friend arrives at the other side – especially when all they come out with is ‘Hi, we are from Switzerland. Where is the nearest pub?’ It was 4am and they were just setting out; breakfast in Soho. I met up with the cop from last night’s drama in the park job as he knelt over the supine body of a Latvian drunkard who dropped to the ground in front of him and pretended to be dead so that an ambulance would take him to hospital. When I recognised this and told him I knew he was awake, he opened his eyes and ranted at me about having fought in the Balkans and that he was ‘epileptic’. I told him I wasn’t interested in his war stories; I’ve been to Croatia and Serbia and I know their history – I also know what was done by some of the Serbs in the name of war in those dark days so I wasn’t impressed with his attempt to elicit ignorant sympathy. He lay there until an ambulance arrived to take him away. His behaviour will never change; as long as we supply his demand, he will continue to cost us dearly. We are chucking good money at a simple problem. All we need is a ‘clean-up crew’ to come and take these people away somewhere that they don’t want to be (not the hospital of their choice). Soon enough they will stop abusing us. And epilepsy is the claim they all make in order to get into hospital. They don’t all suffer from it and his weak and pathetic attempt at having a seizure made no dent in anyone’s conscience. To top off the entertainment, a number of lice, crawling around his belly and beneath his trouser belt-line, began to show themselves and the crew alerted the nurse to the infestation. I found myself scratching at invisible but perfectly imagino-realistic crawling things for an hour or so afterwards. A truck waited to turn right at a junction and a car raced along towards it. The truck tentatively moved its position and the racing car swerved sharply to avoid a possible collision, resulting in a head-on crash into a very tall lamp post. I was called at the tail end of the shift and spent twenty minutes unloading the on-the-phone-no-neck-pain driver from his seat as water and God knows what else spilled from the crushed front end of his vehicle. The lamp post was at an angle and the concrete under it had been weakened, so there was a real hazard – if the post fell it was likely to kill one, two or many people. I did all I could; reassured the drivers, listened to the arguments about who was in the wrong (even though I have nothing to do with that side of it) and generally kept things safe… and as soon as the Fire Service, police and an ambulance got on scene I went back to my station and headed for home. I’m starting a tour of nights and, to be honest, even though twelve jobs came and went, only a few are worth reporting. I met a lovely family from Saudi Arabia whose mum felt unwell but was just suffering a viral infection. I got on so well with them that later on, after I’d agreed that mum could get on with her night and go out to the West End, I ran into them and we all chatted on the pavement. Only two of the daughters spoke good English but their mum was still up for a laugh and we joked regardless of the language barrier. I learned a lot about people from Saudi in that short time. Photo’s were taken like we were all old friends and then they went onto their futures. They made my night. The in-between call that depressed my warm, fuzzy feelings, took me to a park where a 20 year-old man was behaving like a two year-old child after having taken in a little alcohol. According to his friends this often happened and it didn’t take much booze to do it. The hint, I would suggest later on to him and his mates, is not to drink at all. He wailed and cried and thrashed and refused all help until I bundled him, with the help of a couple of police officers, one of whom I seemed to click with as if we’d been friends for ages, into the car until an ambulance arrived and the not-amused crew took charge of him. I chatted for a while to the Ulster-born cop and we bantered about the job and the rotten politics of it all. It made us feel better I guess. Then I left and he and his partner attempted to go home. Unfortunately, as a passing police officer told me, his car had a flat battery so he was going nowhere. Poor sod. The last patient of the shift ruined it. She called an ambulance for a swollen ankle, probably caused by an infection. Her room was littered with needles and syringes and she was the shape and size of a self-neglecting drug addict. She’d refused to be taken to hospital earlier, so this was the second time an emergency ambulance had been called for her. Nobody was impressed... least of all me.